Jul 08 TAG Heuer’s Latest Model in Carrera Ladies’ Watch Line. 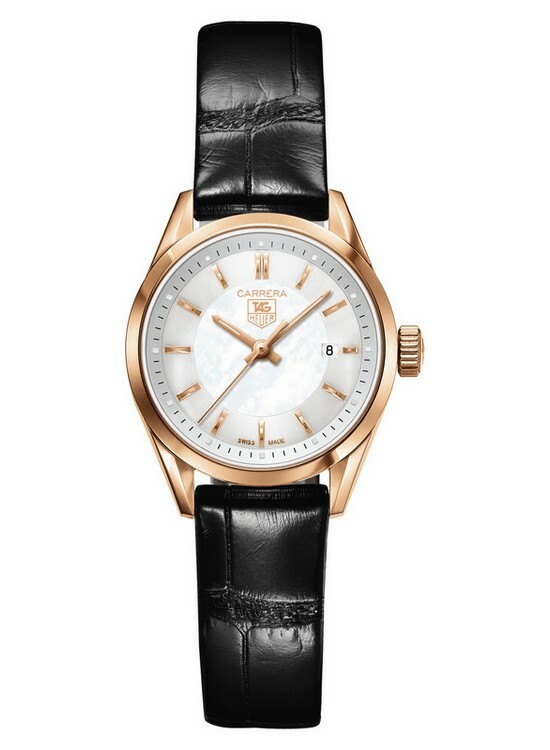 Swiss watchmaker TAG Heuer’s Carrera Ladies’ watch line has always offered feminine watches with an emphasis on an understated elegance and its newest in the line, the Rose Gold 27mm model, is no exception. 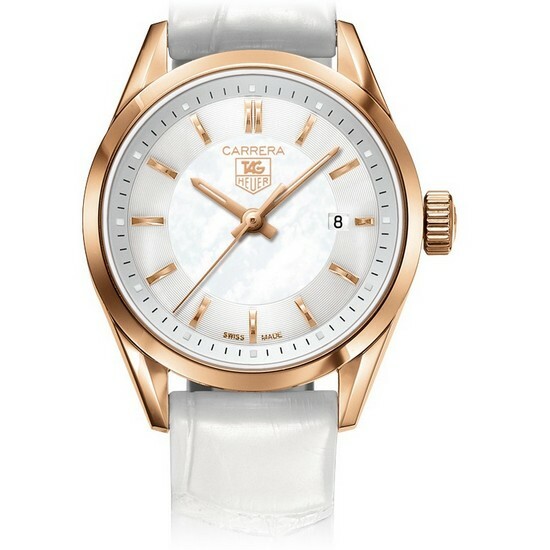 The Tag Heuer Carrera Ladies Rose Gold 27mm with the glossy white alligator strap. A round 27mm case made of polished 18k solid Rose Gold with a bezel and crown also made of solid 18k Rose Gold surround the white mother-of-pearl dial. The dial is protected by double-anti-reflective treated, scratch resistant crystal sapphire to ensure durability and clear readings. The indexes are hand applied and made of 18k solid Rose Gold while the polished 18k solid Rose Gold hour, minute, and second hands feature luminescent markers for easy visibility in less-than-quality lighting. At 3 o’clock is a small date window, big enough to be legible yet small enough to maintain the elegant simplicity of the device. The Carrera utilizes an extremely accurate quartz movement. Quartz movements are battery powered and uses an electrical current to cause the quartz crystal regulator to vibrate consistently at a frequency of approximately 32,768 times per second. This provides the movement a near perfect precision with a variation of only a few seconds a month. The quartz movements used by TAG Heuer offer excellent resistance to magnetic fields and shocks. The batteries for the quartz movements in this watch have a service life of roughly 2 years and an internal End-Of-Life battery indicator that will cause the seconds hand to make four-second jumps at intervals of four-seconds to indicate the battery is weakening. 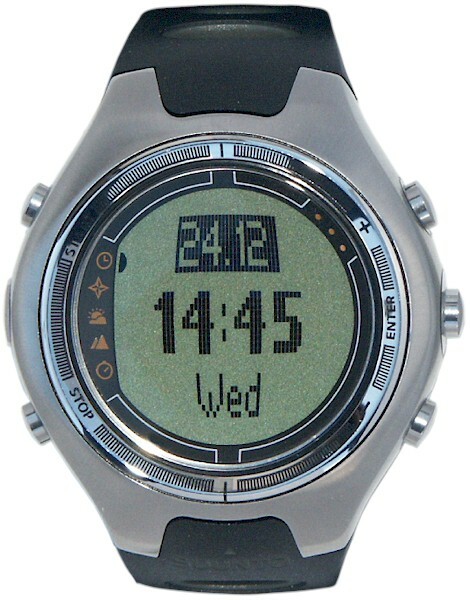 The watch will, however, continue to display the correct time until the battery is completely spent. The features of the quartz movement ensure that this is a watch that will need minimum attention, as far as the movement is concerned, making it an ideal accessory for women who may be more-or-less careless in that regard. The slight size of this watch epitomizes the emphasis on femininity of the design of this watch. The simple yet elegant appearance of this watch is emphasized by the slight contrast of the 18k Rose Gold components and the mother-of-pearl on the dial. The watch comes with the choice of either a black glossy alligator strap, to offer a contrast to the delicate colors of the dial and case, or a white glossy alligator strap to compliment the delicate colors of the dial and case, while both have an 18k solid Rose Gold pin buckle. The Tag Heur Carrera Ladies’ Rose Gold 27mm with glossy black alligator strap. This is a simple, elegant watch that utterly embraces femininity through the size of the watch and the combination of the white mother-of-pearl of the dial and the Rose Gold of the case, indexes, hands, bezel and crown. This watch exudes the luxury and elegance of the woman wearing it, whether worn in a formal environment or a casual one. In short, the simplicity of design and operation of this beautifully understated watch sure to please almost any woman. One sign of a celebrity’s fame is the kind of watch they wear. Rolex or Christian Dior on a celebrity’s wrist means they’ve made it to the “million dollar club.” Timex means they haven’t. Most celebs have a favorite luxury watch that they love to wear or endorse, gaining publicity for themselves and the watch brand. Diane Kruger has been brand ambassador for Swiss watchmaker Jauger-LeCoultre since 2009. She wears the Rendezvous ladies watch. Available in pink-gold or stainless steel, the watch exudes a feminine elegance that was inspired by Diane Kruger. Says the brand on its official website: “Her innate grace, her cosmopolitan spirit and her choices inspired the feminine world of Jaeger-LeCoultre.” This watch is truly beautiful, with a diamond-set illuminated bezel, 1930s Art Deco inspired numerals set upon a guilloché dial, and a sapphire crystal case-back. It is well known in Hollywood that Jennifer Aniston is a “Rolex-only” kind of girl. There are hundreds of pictures of her out on the town with a Rolex on her wrist. Although she has been photographed wearing a black Rolex Daytona, it is clear that her yellow gold Rolex Datejust is her favorite. Her Rolex Day-Date is an 18-carat yellow gold piece with a fluted bezel and a champagne colored dial. Brand Ambassador for “Swiss avant-garde” watch manufacturer TAG Heuer, Leonardo DiCaprio loves to sport the TAG Heuer Carrera timepiece. With a Calibre 16 Automatic Chronograph powering the watch, it’s a perfect match for motor racing and other fast-paced sports. Both DiCaprio and TAG Heuer share a common goal of environmental sustainability. Charlize Theron has moved from the ads of Christian Dior’s “J’adore” perfume to the Christian Dior VII watch. This watch is extravagant to the extreme. With a white ceramic and steel casing and diamonds set into an opaline and silver dial, it’s hard to decide which is more beautiful – the watch or Charlize Theron. Kate Winslet has Longines “ambassadress of Elegance” since 2010. Swiss watch brand Longines, established in 1832, has had many celebrity ambassadors including tennis player Andre Agassi, Australian actor Simon Baker, and Indian Beauty Aishwarya Rai Bachchan, but it could be argued that Kate Winslet is the most elegant face to wear their watches. She wears the Longines Dolcevita, an elegantly designed timepiece that was inspired by the easy-going Italian way of life – la dolce vita. Everything about this watch has femininity to it: its rectangular stainless steel and pink gold case and bracelet, its tear drop hour markers, and pink hour and minute hands. Ebel 1911 Tekton Automatic Chronograph FC Bayern Munich– Ebel has partnerships with many professional soccer clubs in Europe and has produced limited edition models for other clubs, like Premier League club Arsenal, but the limited edition model Ebel crafted for Bundesliga club Bayern Munich is my favorite from a visual standpoint and also figures to be the most durable. But probably the feature that appeals most to soccer fans lies in the watch’s movement, the Ebel Caliber 245 which the company claims is the first movement specifically designed for soccer. The Caliber 245 is designed to measure match-half times and even indicates extra time when needed. Suunto X6-HRM– Finnish watchmaker Suunto was probably aiming to appeal more to the outdoorsmen than the athlete (as evident by the inclusion of altimeter, clinometer, thermometer, barometer and compass) but the heart-rate monitor and the ability to record information from the watch directly to your computer is a useful aspect for any athlete. The aluminum case and black rubber bands should make this watch effectively durable for most sports, at least not the overtly physical ones. 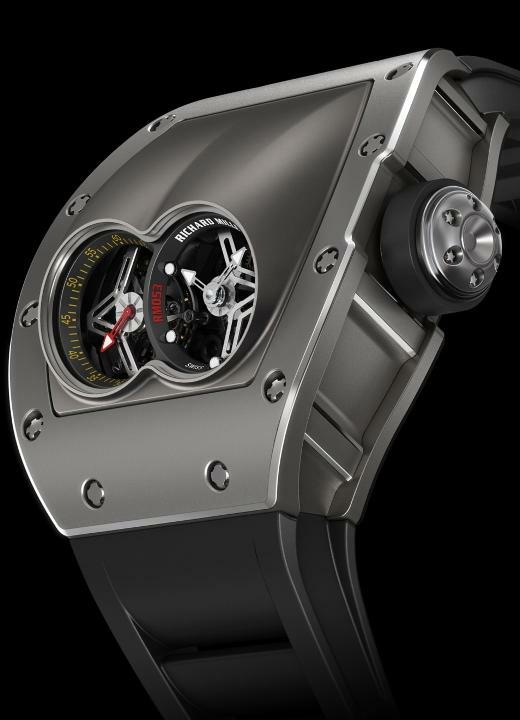 Richard Mille RM 053 Tourbillon Pablo Mac Donough– Designed in conjunction with the world’s top ranked polo player, Pablo Mac Donough, this watch was made to survive the physicality of polo matches and therefore should be more than capable of being durable enough to survive in any sport. Throw in the fact that it is a unique and elegant piece and it was a lock to make this list. Traser H3 P6600 Type 6 Mil-G– Any watch worn by the United States Navy SEALs and the British SAS is probably durable enough to handle any sport. This simple black watch prides itself in its readability and is more than durable enough to accommodate sports of all kinds. 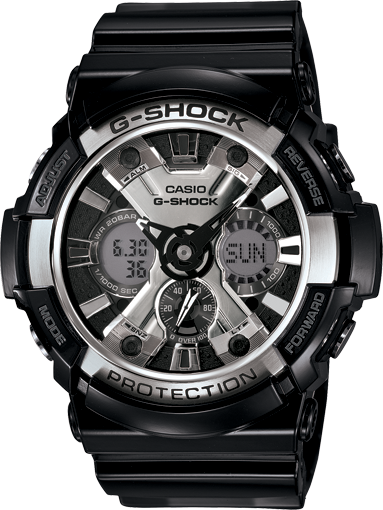 G-Shock Classic GA200BW-1A– The Casio-owned G-Shock brand is designed to be ultra-shock resistant and this watch is no different. Which makes it a good watch for athletes in more physical sports. 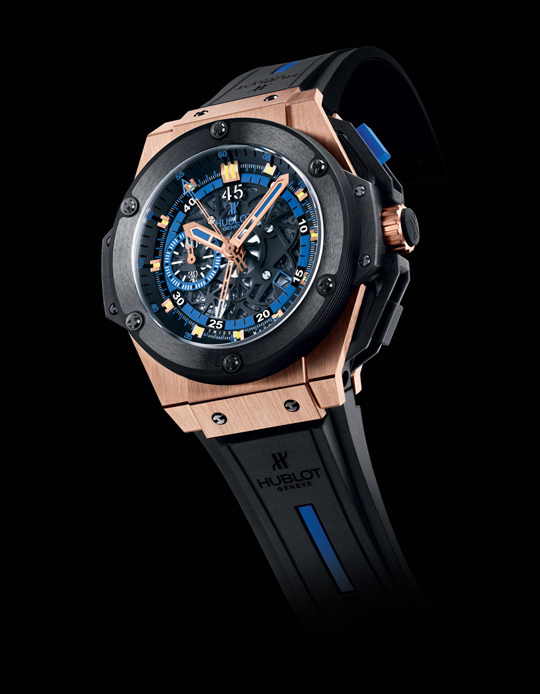 Hublot King Power UEFA Euro 2012 Ukraine– This limited edition watch was made to commemorate the Euro Cup 2012 soccer tournament and is one of two designs based after the host-nations, the other model being Poland. It features a 45-minute counter at 9 o’clock, the same length as a half of soccer; a feature sure to please soccer fans. 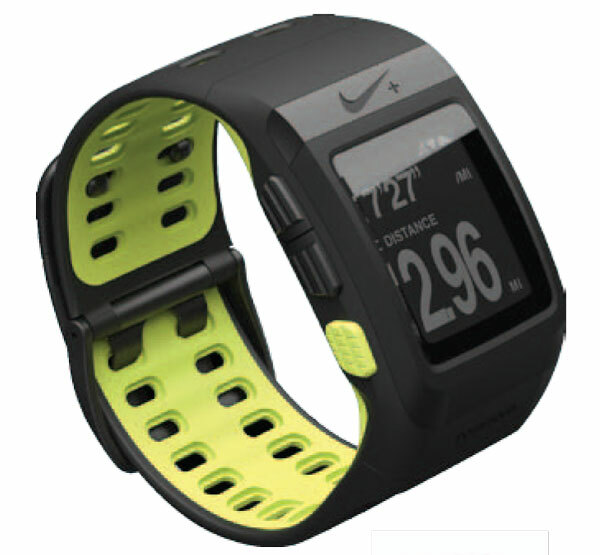 Nike+ Sportswatch GPS– With a TomTom powered GPS, and all of the interfacing capabilities of the Nike+ brand this is likely to be a favorite among runners but at a weight of a mere 2.33 ounces it should also appeal to athletes in different sports as well. 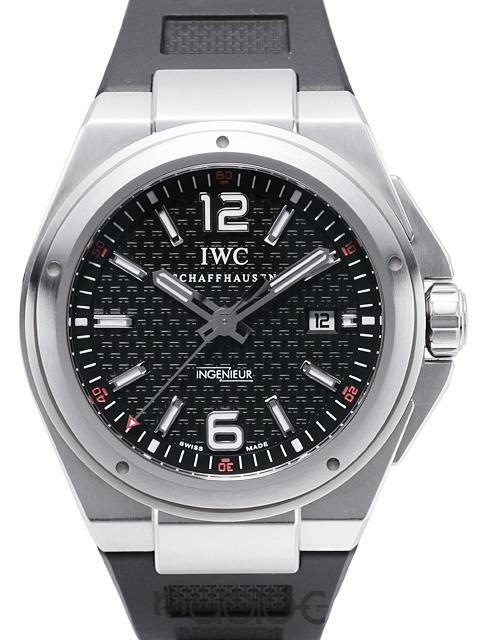 IWC Ingeniur Automatic Mission Earth– A watch designed to master extreme conditions, like the top of Mt. 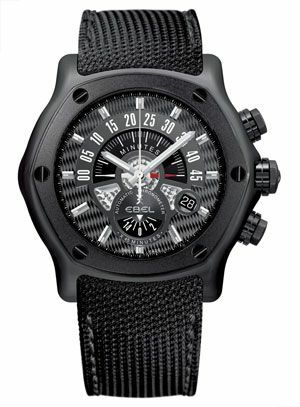 Everest or the deserts of Africa, this watch could do well for any athlete, especially with its integrated shock absorber softening the blows to this ultra-durable and stylish timepiece. TAG-Heuer Professional Sports Watch Golf Watch– This stylish timepiece is exceptionally lightweight and promises to offer comfort and ease of movement; characteristics all athletes would enjoy. 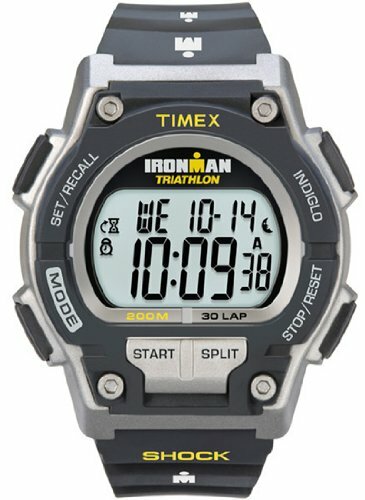 Timex Ironman Shock Resistant Steel 30-Lap– Definitely one of the least expensive watches on this list, this is a great watch for runners. The 30-lap Memory Recall, 99-lap counter and 24-hour countdown timer are all features sure to please runners while its durability should help it appeal to athletes in other sports as well. Well, that completes my list and, as you can see, I decided to focus more on durability and functionality than on price or design. While I’ve included watches in a wide range of prices I think the right watch is entirely dependent on which sport it is being used for, not how expensive it is. These are just the watches I felt best fit my parameters and you’re more than welcome to disagree as long as you admit that never has there been a more motley assembly of watches on a top ten list than this one. TAG Heuer is probably one of the most sought after luxury sport watch brands in the world; they are also the most widely copied. Everyone wants to own one, and so the demand has driven replica manufacturers to come out of the woodwork. They all claim to offer “virtually the same” product, but do you buy it? Don’t buy it. 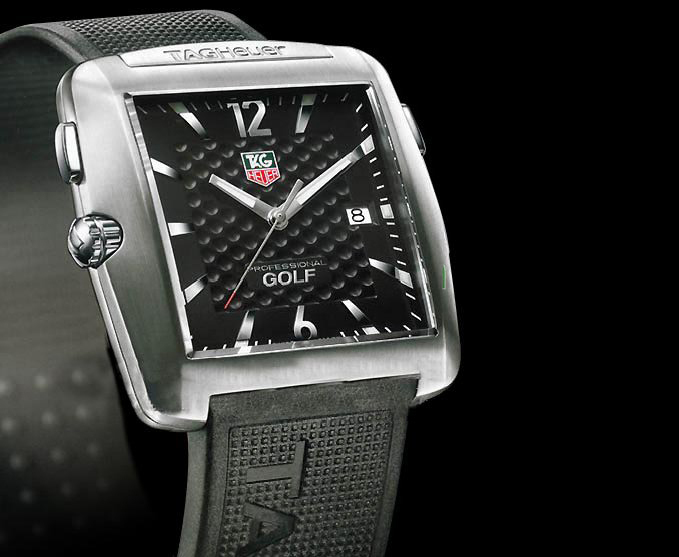 TAG Heuer has been making high quality watches for over 150 years. They pride themselves on that quality and there is not a fake out there that is crafted with the same fine materials or superior craftsmanship. There are many ways of detecting a fake. First of all, most makers of replicas aren’t meticulous about the details of their watches. You can look for misspelled words or pieces that aren’t quite quality. Common sense plays a big part here. If things just don’t look right, you probably have a fake. If you still aren’t sure after close examination, you can take your watch to an authorized repair center and have them open up the back. Most watch repair men can detect a fraud, very quickly. TAG Heuer watches are pricey and worth every penny. Don’t get taken by a fake. What Does Your TAG Heuer Say About You? A watch on a man’s wrist is much more than a device for keeping time, it has turned into a fashion statement, as well as a reflection of one’s personality and level of success. TAG Heuer has long been regarded as one of the industries leaders in sport luxury watches, producing some of the most creative and innovative chronographs, around. Their styling is appreciated by watch enthusiasts across the globe, and this is why TAG Heuer is among the best selling men’s watch brands in the world. Facing tough competition, like Rolex, Breitling, Omega, Cartier, Invicta, and Fossil, TAG Heuer holds their own, in the race to make the best sport luxury watch. This Swiss watch maker is highly sought after, and created their first ever chronograph, back in 1882. Since then, TAG has been on a tireless mission to improve on their watches, offering advanced technology and avant-garde styling. Watch connoisseurs consider TAG Heuer timepieces to be a great investment, noting that the TH look is unique and well crafted. Wearing the right TH on your wrist will let others in on your personality and your lifestyle, and can be seen as a barometer with which to gauge your accomplishments. Make your personal fashion statement, through your choice of TAG. Following the TAG Heuer Tesla Roadster around the world can keep a gal pretty busy. This week the Roadster landed, figuratively speaking, at China’s Great Wall. This battery operated machine has plugged in everywhere from India, to Russia…and now they must find the power of the Great Wall. As the Tesla roadster pulled into, what is thought to be the most culturally significant landmark in its year and an half road trip, who was waiting? None other than the most well respected actor in China, Chen Dao. Dao is famous for his role in “Hero” and his upcoming debut in “Aftershock”. The Chinese actor took the TAG Heuer Tesla Roadster out for a quick spin, and was thrilled to be the Ambassador for the Chinese stop. The Roadster’s trip, entitled “Odyssey of Pioneers” is a 37,000 kilometer jaunt, covering 15 cities on a total of 3 continents. The stop in Beijing was the eighth of the 15 stops for this zero emissions vehicle. The Tesla Roadster is a revolutionary car, which runs on conventional electricity. The sources the Roadster has drawn power from are hotel outlets, solar panels, and even a barn in Switzerland allowed the Tesla to plug in. You can track the Tesla’s journey on Facebook, if you are interested, or stay tuned for my next update! Timekeeping has become an obsession for many of us, over the years. The quest to tell time accurately and precisely has lead watch makers down a path of innovation and creation. TAG Heuer is among the world’s leaders in innovative design and exploration of new and interesting ideas, with regard to keeping time. This company has a well deserved reputation as a trailblazer in the industry. For over 150 years TH has been searching for new and better ways to keep time, and this year they have released a revolutionary new concept watch, which will in time change the way watches are crafted, forever. The TAG Heuer Grand Carrera Pendulum concept watch is the piece and what makes it so special is that the inner workings are based on a totally new and forward thinking system, which powers the timepiece. 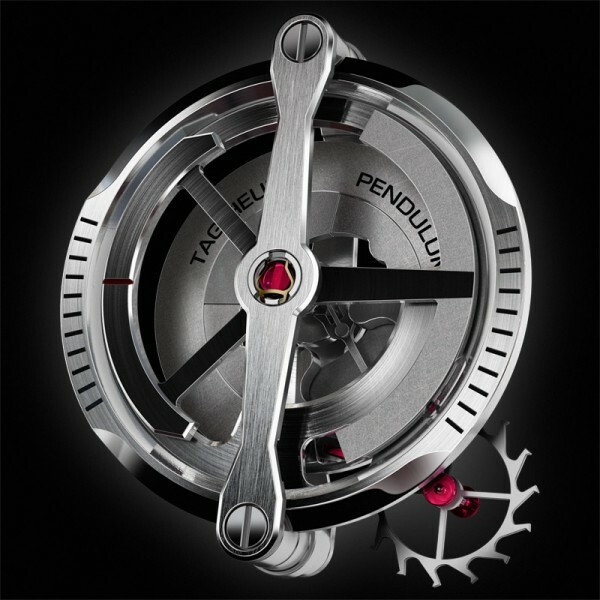 The Pendulum watch is ingenuity at its finest. 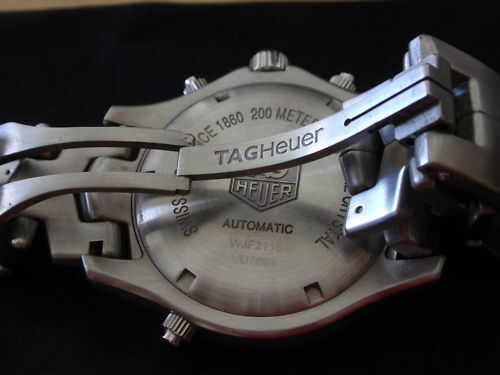 TAG Heuer has used the principles of gravity and magnetism to build a completely new movement. The Grand Carrera Pendulum has no electronic parts, and is powered by the gravitational pull of 4 specialized magnets, which create the torque necessary to move the balance wheel. This is a steady and reliable source of power, which should remain constant for decades. Leave it to TAG to re-invent the wheel! TAG Heuer is a true innovative force in the industry. Their creations are legendary, and have a place in watch making history, and their newest addition to the TAG line of watches is no exception to that. The TAG Heuer Aquaracer 500 is the most accurate and reliable timepiece TH has produced, to date. This high end performance watch will astound you, with its functionality and precision Swiss quality. 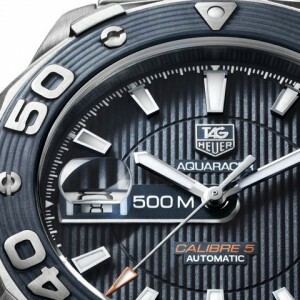 The TH Aquaracer Calibre5 is a sport luxury watch, which was born from the extreme conditions faced by deep sea divers. This professional timepiece will push itself to the limits of and high pressure situation. TAG Heuer patented its first water resistant case, back in 1895, but the new Aquaracer blows that initial invention out of the water. 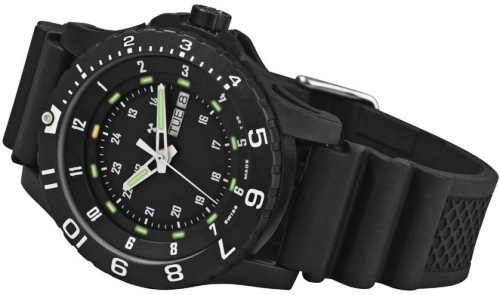 The original underwater line was launched in 1982, the 2000 Series was TAG’s first professional diving collection, and the ancestor of the Aquaracer. The new Aquaracer Calibre 500 is the most extreme professional diving watch made by TH. It features a unidirectional rotating bezel, a TH symbol. It has brushed steel accents and molded rubber detailing. The Aquaracer has a large 43mm case, and offers super luminescent hands, arms, and indexes, for easy reading at extreme depths, and it is water resistant to an amazing 500 meters! 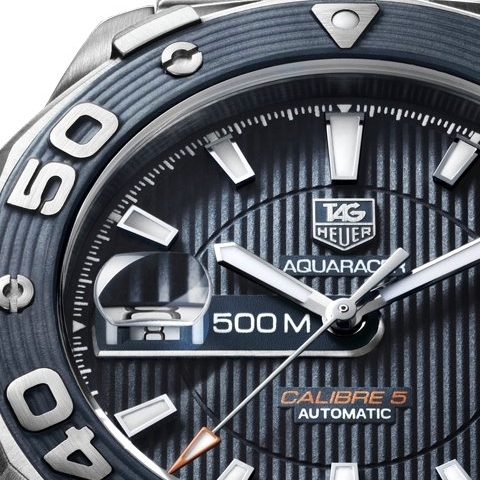 The new Aquaracer Calibre 500 will add another notch in the belt of this fantastic watch maker, will it be an addition to your collection, as well? First and foremost, TAG Heuer is a watch making company. They have earned a legendary reputation for their innovativeness and dedication to timekeeping. Creating the most accurate chronographs in history and developing inventions, which were patented, and still in use today by many fine watch companies. They obviously have strong ties to the Formula One racing world, but did you know that TH has a presence in Hollywood? As early as 1960, TAG Heuer was working on the development of the, now famous TY Film Master stopwatch. The Film Master was designed to give Hollywood directors the ability to track how much of their film footage had been used in a particular filming sequence. These innovations for the film industry gave TAG Heuer a place on the big screen. Today, the avant-garde watch maker has a presence in the filming of many great movies. In “Good Luck Chuck” starring Dane Cook and Jessica Alba, Dane is wearing a TH Monaco Chronograph. 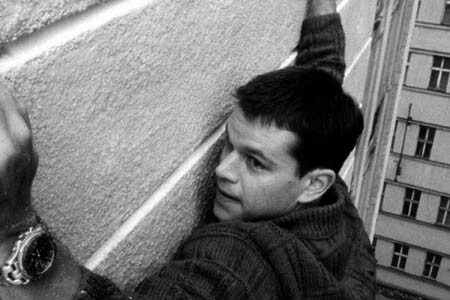 In Jodie Foster’s film, the “Brave one”, her character sports a TAG Heuer Twin-Time Carrera, and in “The Bourne Ultimatum”, the famous character which Matt Damon plays, wears a TAG Heuer Link Chronograph, featuring a blue dial. This huge screen presence is evidence of the respect that actors and directors have for the TAG Heuer name. It’s obvious, TAG Heuer is a fantastic watch maker, but the people behind this big name, possess big hearts, as well. This became evident, when recently TAG joined forces with racing legends, like Lewis Hamilton, Fernando Alonso, and Sebastien Bourdais (to name a few) to work on a project for Save the Children. Save the Children is an independently run, children’s’ charity organization, which helps to fund futures of needy children around the world. The collaboration was to produce a photo book, full of powerful images of the drivers, and their dream cars. TAG invited a diverse group to take part n this, first ever endeavor. All of the invitees donated their time, their photos, and their passion to this project, being shown in a personal light, and with the GT cars that made them famous. The book is entitled “Dream Machines Driven by Generous Hearts”, and all of the proceeds driven from sales of the book will go directly to Save the Children. The money will be used to fund children’s sports projects, and enable those children to expand their world. 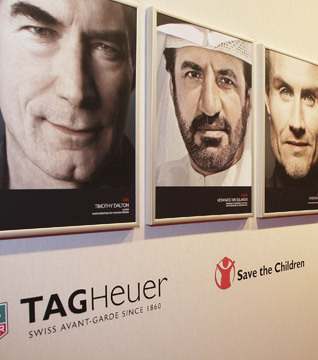 TAG Heuer’s respect for excellence is apparent, and so is their compassion for others. Pick up your copy of “Dream Machines Driven by Generous Hearts”, today.